Learn more about Zsuzsa Berend’s new book from the publisher’s website. I reported some of my findings in Beyond Trafficking and Slavery’s ‘may the surrogate speak’ series back in December 2015, a collection of articles which demonstrated the importance of considering the local context in which surrogacy takes place. If we want to understand why this reproductive practice has been growing and evolving in the US and elsewhere, we need to appreciate the concerns, experiences, and positions of the surrogates who not only participate in it but actively propagate it. These concerns, experiences, and positions can be strikingly different in different socio-cultural contexts. 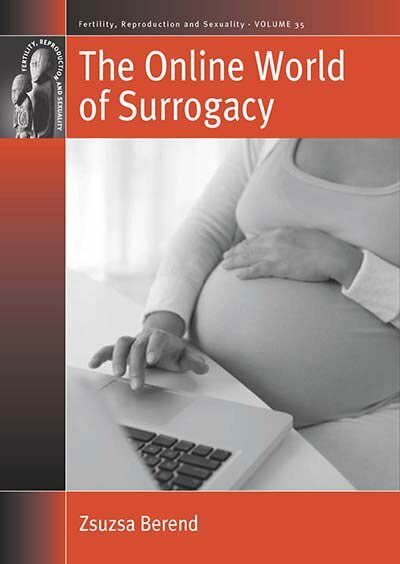 The surrogates on SMO – the overwhelming majority live in the US, with an occasional Canadian or Brit joining the discussions – most often refer to surrogacy as a “journey”. The first stage is the match; surrogates and intended parents meet through intermediaries such as an agency or a lawyer or match independently online. Since most surrogates are married, husbands and children are important fellow travellers on this journey, yet they are often missing from critics’ as well as journalists’ accounts of surrogacy. SMO surrogates most frequently describe their marriages as “partnership”. My children are mine because I raise them, not because of some DNA. Annabel’s post is a typical example: “We work together on big decisions and always come to an agreement together. … When we're at an impasse we work it out. If it is something that is very important to him I may relent but he reciprocates”. Surrogates often had their heart set on surrogacy and it took some convincing before husbands got on board, yet women agree that it is worth waiting and taking husbands’ concerns seriously. Countless discussions reveal that other relatives’ concerns do not matter that much, and women understand these concerns in the context of their relationship with family members. “My mother-in-law never approved of me, so I don’t need her support” is a fairly typical example. Surrogates develop a relationship with the intended parents – in SMO jargon simply ‘IPs’ – and vow to nurture their foetus. According to the emerging definition on SMO, surrogacy is, at its core, “making IPs parents”. Intended parents’ parenthood is a taken-for-granted cornerstone of surrogacy. “We are all carrying someone else’s child”, surrogates say, no matter where the genetic material comes from. “Parenting makes parents, not genetics”. This view is not as surprising as it may sound at first, given that western notions of kinship take relationships into account as well as genetic ties. “My children are mine because I raise them, not because of some DNA”, is how one surrogate drew parallels between her motherhood and her intended mother’s. The US political rhetoric of “wanted children” and “deserving couples” also informs surrogates’ decisions to carry for people who “are desperate to have a family”. Working toward such a goal bestows value on the surrogate. Once the match is made, the parties negotiate the contract. I found that contrary to mainstream legal theories of contract – in which both sides are assumed to trying to maximise their profit – surrogates and intended parents often do not see the contract the same way and are not always trying to achieve the same goals. Most surrogates think of the contract as the basis of a social relationship with IPs. They see contract negotiations as a litmus test of character and compatibility, in addition to the terms of a fair transaction. Negotiations are indicative of the rapport surrogates hope to have: “it's how you all handle the negotiations which will clue you in on your future relationship and communications”. Surrogates are also keenly aware of the limitations of the contract in regulating meaningful relationships; friendship is real if it is freely given. This has consequences for surrogacy outcomes. Surrogates, intent on making “IPs’ dreams come true”, agree that IPs’ parental rights should be spelled out and protected but do not insist on protection from responsibility for these babies in case IPs “walk away” from the arrangement. Also, surrogates often compromise in order to avoid being seen as “money hungry” by IPs, although there has been a significant learning curve as women compare contracts and stories. Surrogates dislike being bargained down; they wish to be treated as sympathetic and generous partners in the journey. In part because of the social relationship surrogates seek to build, and in part despite of it, money is a hot topic in SMO communications. The currency evoked in these discussions is both monetary fees and moral worth. While the financial side of surrogacy has both important practical and symbolic significance, monetary dealings are always understood in SMO discussions within the context of the relationship with IPs. Surrogates dislike being bargained down. They wish to be treated as sympathetic and generous partners in the journey, and discussions show that women carefully match the various monetary transactions with their interpretation of the relationship. They generally assert that their compensation is one side of a reciprocal and mutually beneficial relationship. SMO discussions reveal surrogates’ deep desire to transform the surrogate “journey” into a mutual gift-giving relationship where tangible and intangible gifts flow back and forth. They value intangible gifts, such as intended parents’ time, attention, and trust. Their counter-gifts include efforts to allow couples to experience “their pregnancy” and also material presents that mark memorable occasions. Discussions of gift-giving practices suggest that surrogates see them as tools to generate trust, closeness, and reciprocity. To reject the gift is to reject the giver. When couples rejected a surrogate’s gift, whether by returning a material object or by redefining surrogacy as a service they had paid for in full, surrogates often expressed feelings of hurt and betrayal. SMO support helped these women to get through emotionally difficult times, and even more importantly, helped shape collective definitions of the practice and “the good surrogate”. “It is not about us, but about the lives and families we create”. Ultimately, SMO discussions also articulate the coexistence and interrelatedness of money and gift, contract and love. Women’s online discussions and debates reveal the fascinating complexities of the emotional as well as financial and contractual aspects of assisted baby-making in the US. My findings help debunk many common ideas about surrogates in the US. Rather than being destitute, duped, or exploited, SMO surrogates are thoughtful and opinionated women. Many have acquired an impressive knowledge about legal and medical issues, and they engage in long, involved and often philosophical debates about responsibility and altruism, reciprocity and obligations. They can be fiercely loyal to their IPs and fellow surrogates but also passionately argumentative, and often very humorous as they poke fun of each other and themselves.